Plot: Desperate to pay the bills and come through for their loved ones, three lifelong pals risk it all by embarking on a daring bid to knock off the very bank that absconded with their money. Starring: Michael Caine, Alan Arkin, Ann-Margret, Matt Dillon. 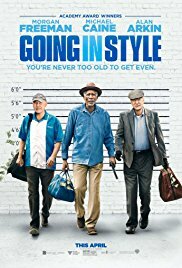 distributed by New Line Cinema «Going in Style» in the US movie theaters released on April 7, 2017 and has grossed over $85 million worldwide; dvd and blu-ray release date was set for August 1, 2017. Rent from Netflix and Redbox from August 8, 2017. «Going in Style» in the UK released in movie theaters on April 7, 2017. The movie released on dvd and blu-ray on August 14, 2017.